Trump's statement on Thursday marked a dramatic shift in U.S. policy over the status of a disputed area that Israel captured from Syria in the 1967 Middle East conflict and annexed in 1981 - a move not recognised internationally. Against this backdrop of hostility towards the U.S. move, Secretary of State Mike Pompeo landed in Beirut on Friday after visiting Israel. He is expected to raise pressure on the government to curb the influence of the Iran-backed Hezbollah. It follows the U.S. recognition in December 2017 of Jerusalem as Israel's capital - a decision that also drew international criticism as the city's disputed status remains at the heart of the Israeli-Palestinian conflict. 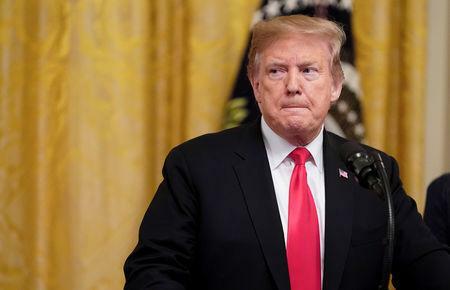 Russia, an ally of President Bashar al-Assad with forces in Syria, said Trump's comments risked seriously destabilising the region, and it voiced hope the statement was just declaratory. It said United States with its "stupidity and arrogance" had no right to decide the fate of the area and any move to recognise Israeli sovereignty over it was "an illegal action with no impact". 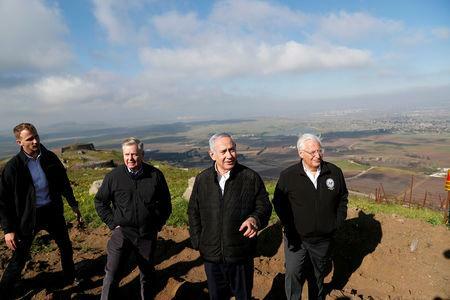 Jason Greenblatt, a senior White House adviser, said "under any conceivable circumstance, Israel could not give up the Golan". "To do so would endanger Israel's very existence," he wrote on Twitter. But Fouad Mundhir, a Syrian whose village is in Israeli-occupied Golan, said Trump was "cancelling the will of an entire nation". "You say you are carrying the flag of democracy, okay, Mr. Trump, have you taken into account the will of the people of the Golan?" he told Reuters in Jaramana, near Damascus. In the Golan itself, Druze villager Sheikh Mahmoud Nazeeh, also rejected the move. "Trump can make his statements and say he wants to make the Golan part of Israel. But we know this will stay Syrian land," the 70-year-old said. The European Union said its position on the status of the Golan Heights was unchanged and it did not recognise Israeli sovereignty over the area. Germany said any change in borders should be "done through peaceful means between all those involved", while France said it did not recognise the Israeli annexation of the Golan Heights and any recognition was contrary to international law. Israel says Syria's civil war has reaffirmed the need to keep the plateau - coveted for its water resources and fertile soil - as a buffer zone between Israeli towns and the instability of its neighbour. In Lebanon, Pompeo is expected to flag U.S. concerns about Shi'ite Muslim Hezbollah's growing role in government: the group has three cabinet ministers and together with its allies controls more than 70 of parliament's 128 seats.